Float into Downtown Salida, Colorado. Salida, Colorado is home to the largest historic downtown in Colorado and the Arkansas River runs right through it. This mild whitewater trip starts seven miles up river at the Big Bend Recreation Site. There are some class II-III rapids (depending on flows), but it is primarily a scenic float with views of the Sawatch Range, which includes eight of the 20 highest peaks in the Rocky Mountains, and the Sangre de Cristo Range – another high and rugged mountain range of the Southern Rockies. Other notable views include the historic Salida Smokestack and Tenderfoot Mountain. This trip is brought to you by River Runners at Salida, which is located in the Salida Adventure Hub on the Arkansas River between the Boat Ramp and Boathouse Cantina. Take out at the Salida Boat Ramp and walk back to our outpost to view photos. When is the best time to raft the Salida Town Run? The Salida Town Run offers the best experience during summer and fall. In high water years this section is more than just a float trip during peak runoff, but is still appropriate for younger families. 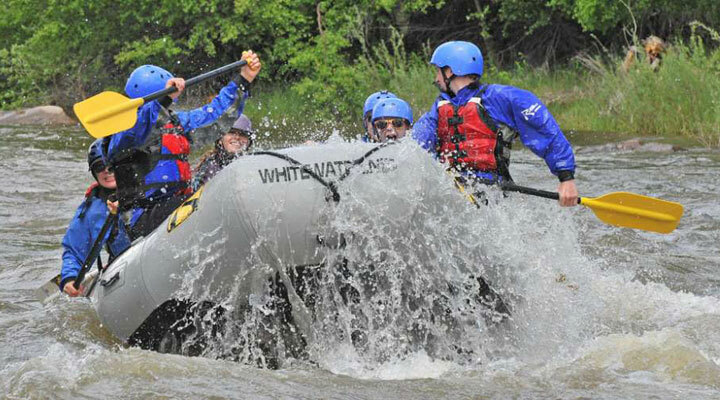 PFDs, helmets, paddles, splash gear, first aid, and all other safety equipment is included with the price of your Salida Town Run rafting trip. You may also want to bring base layers (such as polypro or other quick-dry fabrics), sun glasses (straps sold at River Runners), sun block, water bottle, and board shorts.